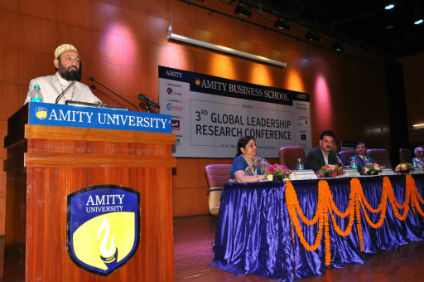 Prof. (Dr.) Sanjeev Bansal, Director Amity Business School and Chairperson GLRC-2018 presented an overview of the two day conference and shared that during the two day conference more than 174 research papers were presented in 12 sessions, 15 keynote addresses and 68 panelists deliberated upon the theme in the presence of 200 distinguished guests from corporate and academics. Addressing the gathering Dr. Mustafa T. Saasa, Chairman, Raj Group of Companies, Dubai said that there is deficit of leadership in the world. He mentioned that a good leader is able to derive extra ordinary results from ordinary people. He emphasized on rapid changing market trends causing reduced life cycle of products and services. He called upon the budding professionals to develop a dynamic business plan and suggested to evolve and calibrate their business with time. Dr. Saasa apprised that with technological advancement and 4th revolution, many companies saw exponential growth and earned fortune ethically in a short span of time. He advised the students to seek opportunities with every change and urged them to act immediately on provided opportunity since it is now short lived He remarked that a business can sustain if the foundation is laid on values and ethics. Sharing his views Mr. Rajan. S. Mathews, Director General, COAI said that instead of growth, development should be the focus for transformation and Nation building. He apprised that conducing inclusive environment is important for sustainable development. He mentioned that the world is at the cusp of knowledge based revolution and competitiveness must be the hallmark of global norms. Mr Ranjan emphasized on understanding of required skill sets to succeed in knowledge economy. Talking about governance, Mr. Mathews averred that integrity and truth are the virtues of good governance. He pointed that these virtues are now a marketable commodity for a successful governance in business. Speaking on the occasion, Mr. Ajay Lalwani, Country Manager, CIMA said that the technological advancement has revolutionized the way people live. He shared that by 2040, 40% of jobs that we know today will cease to exist. Mr. Lalwani opined that with every revolution, some jobs and businesses are tend to append but it also creates new opportunities for people. Mr. Arun Malhotra, Sr. Corporate Advisor, Nissan Group of Companies apprised that 1% of population is contributing majorly in economic growth and are also the ones who are receiving major share of economic benefits. He emphasized that the competitiveness is now in accordance to changing world and advised the students to develop ideas with fresh perspective to create new markets. He called upon the budding professionals to understand the market and inculcate global skills as per paradigm shift for a successful career. Mr. Dinesh Arora, Secretary ICSI and Mr. Alok Vijayant, GP Director (ADM & Trg), Center for Training & Talent Development, NTRO, PMO were also present during the valedictory ceremony.